The Google Lunar X PRIZE is a highly international competition with teams and team members currently in 63 different countries. While English is generally the common language amongst the teams, there are often situations where it is better for a team to communicate in their native language or in another language altogether -- for example, at conferences, in local news coverage, or during educational events. All GLXP teams will soon be ramping up PR efforts, including frequent video uploads to YouTube. One of the teams asked me a great question today: If a YouTube video is recorded in another language, how can it be translated? I am going to answer this question here on the blog for anyone else that may be interested. YouTube has made some great improvements in the past 6 months. One of these is the integration of Google Translate into YouTube, which allows users to translate subtitles into any language that they want. If you've used Google Translate, then you know that the translation can be a bit rough sometimes -- but you can get the basic idea of what is being said. Of course the key is, there must be subtitles on the video, and not many YouTube videos have subtitles at this point. If you are uploading a video to YouTube and want to provide translation capability, you must create subtitles. That may sound like more trouble than it's worth, but thanks to some new apps, it's actually much easier than you might think! Click "Edit" next to the video that you want to caption. Click "Add Caption", then type the text that you want to appear. Adjust the start time and duration that the text should appear. Then click "Save Caption", and it will appear on the timeline below the video. Add more captions and edit as necessary. To change from the default language (English), click the pencil (Edit) icon below the Default Track, in the lower left of the timeline, then select a different language from the list. Click "Publish" when you have finished the captions. From this page, you can download the captions to your computer (either file format is fine) or copy/paste them into a text editor of your choice. Note: the caption timing may need tweaking, and this is most easily done from a text editor. Now go back to YouTube. Go to the "My Videos" page, find your video, and click the grey "Captions" button. Click the "Add New Captions" button. 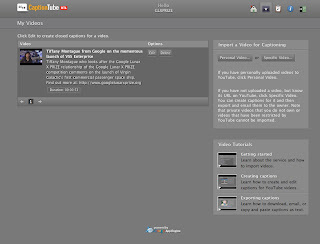 Browse to find the file you just downloaded from CaptionTube. Select the language, then upload. Voila, your video now has subtitles! Ok, but how do I see the captions, and how do I translate them? Push play. See the icon with a triangle in the lower right corner? Hover the mouse over it, then hover over the "CC". Clicking the "CC" will turn on the captions, in English. To translate, hover over the arrow to the left of the CC, click "Translate Captions", and select the language to translate to. Go ahead, try it out. It's pretty slick. Congratulations on creating a internationally-friendly video! Your video can now be translated to any language.